Finally Better and Ready to Race...Maybe! Well after racing Buffman and Squeaky I finally had one day that I felt good, and then the stomach virus that I had avoided for the previous two weeks struck. So that meant another four or five days with no training. This last few weeks has seen me be the least consistent training wise than I have been in a couple of years. Typically, some kind of workout is scheduled in every day, but instead of stressing out about having a race coming up I just rested. The last few workouts have felt really good, and I am really very glad to finally feel good again. Some chest pain still happening, but I am contributing that to dehydration and breathing. This weekend we traveled to a cousin's wedding in Fort Worth, and it was great seeing a side of the family we haven't seen in awhile. 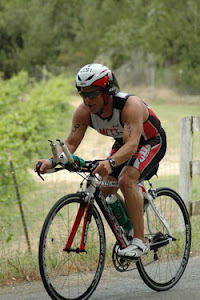 Then this morning we are leaving for Austin for the CapTex Tri on Monday. It has been a few years and several pounds down the road since I raced this race, and am really looking forward to seeing if I don't feel like I am dying during the race this time. I was able to run yesterday in downtown Fort Worth, and it gave me an idea what my body would do with humidity this time. I was able to handle it better than in years past, but I had better start hydrating for Monday now, because I was pouring sweat after a 40 min run. One funny thing is that the last time we raced the CapTex Tri my friend Jerred was making fun of me for sweating so much even when I ate. I had always thought that I would not sweat as much when lost weight, and now that I have I still sweat like a fat dog running up a hill. Oh well! More later as the weekend goes on and probably some interesting comments from Jerred before the weekend is over. Don’t worry I didn’t have a heart attack, but I have been waiting to get back all of the results from the tests and meet with my cardiologist before updating. The initial meeting with the heart doc left us with a couple of questions that needed some tests. I had a slight irregularity in my ekg and a generously sized thyroid. He wanted to check out the ekg with a CT calcium scan, and a treadmill stress test. I decided that after he heard my story of lifestyle changes over the last few years that he either understood my desire to race, or he just considered me a mental case. Since I Already had blood work done recently checking my thyroid levels, and they had came back good we left that alone. I like the still like the fact that I have a generously sized thyroid (weird things strike me funny). The CT calcium scan came back as a zero which is very good, because that means that I do not have any hard plaque developing as of now. The last one I had done 11 years ago showed the same so I considered that a good sign I am on the right path. The stress test was on probably the oldest treadmill I have ever seen, and in the smallest, hottest clinic room you could find. The nurse said that she wanted her patients to at least make it 8 minutes, and that she had to really try to get some of them to just make 5 minutes. The doc wanted me to get to at least above 150 for a little bit since I had noticed some pain above that point. It took a little less than 11 minutes to get there, which you would have thought it would have taken more, but about every 2 minutes they started cranking the speed and incline. Anyway the nurse said that I was the first patient that she had ever had that had lasted that long on the treadmill. Considering that my competition was all in their 80’s I wasn’t sure how to take that comment. Yes I might have been looking at the stress test as a contest. I was tempted to ask her what the record was for time, but didn’t think it would be appropriate. A couple of days later we met with the heart doc to get the news, and it was all good. As far as he could tell there was nothing wrong with my heart. He didn’t know why I was still having symptoms, and decided to run a contrast CT scan on my chest for good measure. Had that done that night and got the news a couple of days later that everything looked great on my scan with my heart and lungs. So with all of the big stuff answered maybe it was all just in my head. I had asked the heart doc before I left him the last time if he was good with me racing. As far as he could tell my heart was good, but he also didn’t say I should race and he didn’t say I shouldn’t. So I decided that I might as well give it a try. Besides the recent issues I was having I felt that I was in my best shape since starting this journey several years ago. Worse case scenario is I start and just have to pull out. So race I did. Waking up I knew I was feeling better than I had in a few days. Considering that I had a few more rest days than normal before a race I was hoping for the best. Funny thing happened walking around before the race I was able to talk to the second triathlete in a week who had the same issues in the past and never really found out what it was either. That was nice to at least know that I wasn’t the only crazy person racing that day. By the time we went off for the swim the water was choppy and rough, but I went out hard at the first as I had planned and made the best of it. I never really got rid of my nerves during the swim, because I kept waiting for my breathing or my chest to go wonky (technical medical term). It didn’t, and I finished with one of my fastest swim times ever in this race. The bike was the usual Buffalo ride consisting of winds and hills, but at least for once it wasn’t heat. The one good thing was that it wasn’t hot that would have probably meant a whole different day for me. I felt good for all of the bike, and tried to keep from pushing too hard on the hills. Looking back I think that I still had it in the back of my head that the pain or racing heart was going to come back. By the time I got back into the park I had been passed by several people, and knew that I was going to have to make up some time on the run. I was hoping I had it in me. Not long after starting the run I had to walk for a few seconds to let my last drink of water settle. When I started back I was able to find my cadence quickly and kept it steady until the turn around. The problem that happened to me on the bike and the run is that I got in these areas where it was just me, which sucked, because it makes it much easier when you have someone in front that you are trying to chase down. Near the turn around on the run 2 old dudes ran passed me like I was standing still, and then near last water stop one more guys passed me. Other than that I was able to catch a few to make up those lost spots in the overall standings. Up until the last mile or two I was feeling great, but then I started pushing my pace fearing that I was going to be passed at the end and the same pain came back. The difference was that I knew it wasn’t my heart instead I could tell my breathing was getting out of hand. This time it was really more of a nuisance than anything. I do know that when I crossed the finish line I didn’t have much left if anything. Given what the last two weeks had been like I was just happy to have started the race. 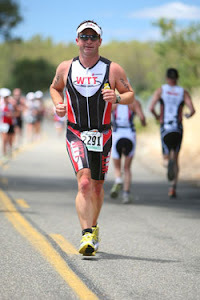 Now comes the next two weeks of training then another race in Austin (CapTexTri) on memorial day. It really feels like things are leveling out. At least I hope! The biggest difference this time then 11 years ago is that this time I have done everything I can do to be healthy. So now I rely on that, my family, and my faith to keep me healthy and happy. Living a healthier lifestyle can be for anyone you just have to find that thing that makes you want to keep going. I would have hated to have gone into this again wishing that I had done something different before I got to a bad place. The time to make a difference in your health is when you are healthy not when a doc is telling you that you had better change or else. It isn’t about the races for me (well maybe a little), but instead it is about preparing for those times when things are going to be tough. Talk to you all soon, and hopefully it will be over a nice IPA. Greetings my name is Wes and I am the man known as Keebler. The name was created for me by two good friends Scott and Jurgen . They said that I was short, fat, and all always happy just like a keebler elf. It is one of the best ways to describe who I was before I decided to start getting in better shape. The name stuck, but thankfully the weight hasn’t. Six years down the road I have gone from a guy that rarely exercised and was overweight to someone that has lost fifty pounds (and kept it off), raced numerous triathlons, and in short I am in the best shape of my life. Along this road the last few years I have realized how much our health and the health of those around us affects us. It really came to light when I lost my Dad three years ago to heart disease. Instead of following the same path I was on I decided to fight my genetics and give myself a chance. Ironically, on Monday I am going to a Cardiologist for the second time in my life. The difference is that the first time I was a normal out of shape West Texas good old boy, and now I am the same West Texas good old boy I just swim, bike , and run a lot. I want to be able to help and inspire others to get healthier for their own reasons, and I am hoping this blog will be one of those ways to help others. Many of you that do know me are well aware that what is written here will have to be sprinkled with a heavy dose of talk about beer, wine, and food. Hopefully, it will also give an example of someone trying to keep a balance between their faith, family, and health. Obviously, there are many other things that are in that balance, but for me those are the big ones. I know myself so much better now than I ever have, and it is really because of how I train I know how my body should feel. I know that something isn’t right, and it might just be an issue with my lungs or might be my heart. I also know that I can’t ignore it, and just train through it. That goes against my ultimate goal of fighting to be here for as long as I can for my family. I am blessed with bad genetics, but it doesn’t mean that all of my story has been written. We can each make our situations better, but we just have to want to fight. So I am just a short formally fat guy that is hopefully going to take you on an entertaining journey, and maybe get some folks to think about how their health can be better.